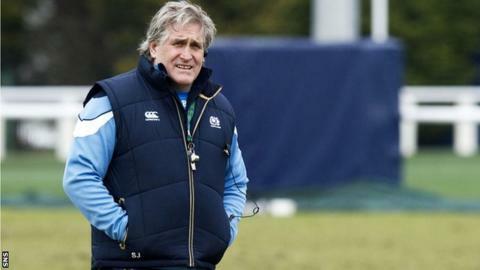 Interim head coach Scott Johnson is eager for Scotland to improve further in the Six Nations match against Ireland at Murrayfield on Sunday. And the Australian also likened Scotland's 34-10 victory over Italy to the beginning of a honeymoon. "That's what a win does," Johnson told BBC Scotland. "It's the start of a honeymoon too isn't it? You always feel good the first night after winning. "It just depends who you marry, that's how it works isn't it?" And he added: "We've got to go back to what we do and do it well, do it better than what we did against Italy." Scotland are looking for their first Six Nations win over Ireland since 2010. "I'm not underestimating what's coming - this is a quality side," said Johnson. "Ireland's pro teams have done exceptionally well at all forms and regional levels, so they've got quality players. "They've had a good record here over the last four or five years. "If we do things right the scoreboard will look after itself. We're going out to try and win, but to win we need to do our part right." The introduction of Edinburgh prop Geoff Cross is the only change to Scotland's line-up. Cross, 30, was named man of the match in Scotland's win over Ireland in a World Cup warm-up match in 2011. He replaces Euan Murray, who does not play on Sundays for religious reasons - a talking point Johnson is keen to move on from. The coach said: "You walk your own path in life don't you? "We can sit in judgement of a thousand things but it's not our place to do that. He's made his decisions, we make ours, let's move on. "I must confess, as a coach who's coached against him before, I underrated Euan Murray as a rugby player. "He's a world class tight-head because his athleticism round the pitch is value added to what he does up front. "So he's a big loss to us. But 12 billion people lie in cemeteries that we thought were indispensable, as my Dad used to say. "We've got able replacements and we're confident with the players we've got."